Before you breathe a sigh of relief after your job interview, there's one more thing you have to do. Write a thank you letter. Taking this simple step can put you ahead of other job candidates and the sooner you do it, the better. 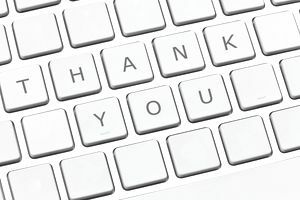 Sending a thank you letter to a prospective employer will not guarantee a job offer, but it will give you an edge if the competition is tight. While many hiring managers aren't necessarily offended when they don't receive thank you letters, they are likely to notice when they do. For this reason, think of thank you letters as a part of your job search strategy. At the very least, sending a note to express gratitude is polite. You wouldn't, hopefully, pay a visit to someone's home and leave without expressing gratitude. Think of visiting a prospective employer at his or her place of business in the same way. Being gracious is the right thing to do. There is another significant reason to send a thank you letter. It is an opportunity—perhaps your only one—to follow up after your interview. Use it to let the prospective employer know you want the job. It may feel awkward to say those words out loud during the interview, but it's much easier to type them. Have you ever walked out of a job interview only to realize there was something you forgot to say? No matter how prepared you are, you may neglect to bring something up when you are under pressure. The thank you letter gives you the chance to make up for it. Also, reiterate something you would like the interviewer to have in mind as he or she makes the hiring decision. When Should I Send It? Send a thank you note as soon after your interview as possible. A few hours later is best, but don't wait more than one business day to get it out. It is critical that the employer read your email while your interview is still fresh in his or her mind. You may be wondering is whether it's okay to send your note via email. The answer is a resounding yes. Since timeliness is everything, email is your best option for getting your letter into a prospective employer's hands as quickly as possible. It is also, most likely, the way you've been communicating with the employer leading up to the interview. Your meeting may have even been a virtual one, taking place via video chat or over the phone. If more than one person at an organization was present at your interview, thank each one in writing. Make sure to personalize the note for each recipient, perhaps by referring to a question that individual asked. What Should My Email Look Like? Keep your email short and simple. It should be no more than three paragraphs long. Use a formal title such as Ms. or Mr. to address the recipient unless the interviewer told to use his or her first name. First, thank the interviewer for taking the time to meet with you, indicating the date you met. If there was something you wanted to say on the interview but didn't, bring it up now. Also, use this opportunity to reiterate a point you want the interviewer to remember when he or she makes a hiring decision. Remember to state that you would welcome a job offer. Do not worry about this making you sound too forward. The recipient will admire your directness and confidence. Besides, if you don't say it, how will he or she know? Carefully proofread your thank you note. Check for typos, misspellings, and grammatical errors. If you cut and pasted pieces from another letter into this one, make sure you made appropriate changes, such as removing the name of another organization or manager. Mistakes in your thank you letter will make you look careless. Save the email as a draft and go back to look at it in a little while. Give it a final once-over before sending it. If possible, have someone else take a look as well. Why Is Having a Professional Network So Important? Do You Know What to Expect in a Behavioral Interview?